Has Nokia's Lumia 1320 'Batman' cast off mask and cape in leaked snap? Another big screen Lumia on the way? Nokia is expected to unveil its high-end Lumia 1520 phablet at Tuesday's big Nokia World event in Abu Dhabi, but on the eve of the launch, another big-screen beauty has appeared in an official-looking render. The now-notorious Twitter leak artist @evleaks posted the purported press snap of the Lumia 1320 device today, adding it will arrive before 2013 ends, rather than during tomorrow's keynote. 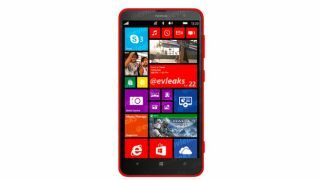 It is thought that the Lumia 1320 won't challenge the 1520 for top-line specs, but will be an affordable alternative with core specs rivalling handsets like the lower-end 4.7-inch Nokia Lumia 625. Those reports claimed the Caped Crusader will only have a 5-megapixel camera and a front-facing VGA webcam, just like the Lumia 625. Little else is known. It appears that Nokia plans to take the wrappers off the Lumia 1320 during the Nokia World launch, where the Lumia 1520 is likely to be joined by a 10.1-inch Windows RT tablet, codenamed Sirius. Just today it was rumoured the Finnish company has an iPod shuffle rival called Nokia Guru, on deck for the high profile event, which will could be its final public showing before handing over the reins to Microsoft. You can join our coverage of Nokia World, which kicks off at 8am UK time (12am PT), Tuesday. Nokia is also kindly live-streaming the event. See what else might be in store for Nokia's most high-spec smartphone.